There is always a lovely surprise waiting for visitors to the Garland Community Garden. 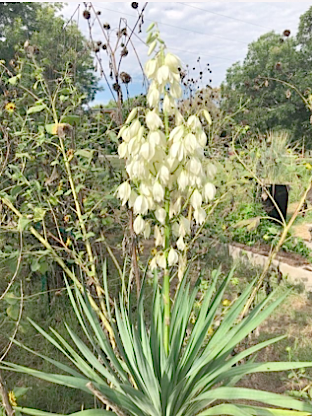 On Thursday I came upon one of our Yuccas in blooming just in time for the fall pollinators. There were no blooms on it the day before. Monarchs are making like crazy—eggs and caterpillars. I know. I’ve had plenty of time to observe them lately. I’ve spent about 3 hours a day from Sunday through Thursday down at the Garland Community Garden, mowing and pulling weeds in anticipation of our weekend version of the North Texas monsoon which actually began a bit early on Thursday night. 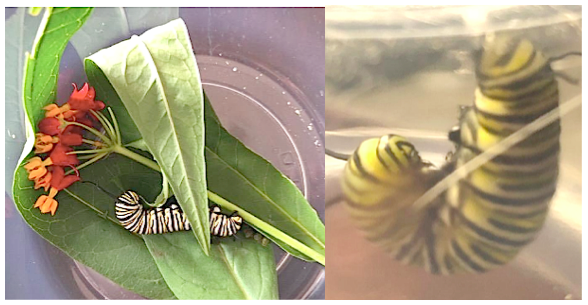 During my time in the garden these past few days, I have found several Monarch eggs on our milkweed plants, one pupa and three Monarch caterpillars. The Monarch (Danaus plexippus) is a milkweed butterfly. They love the Garland Community Garden as we have about 150 square feet total of the garden planted in milkweed. Throughout the week we’ve observed many of them mating and frolicking about. Thus the eggs and caterpillars are no surprise. Already at my house I have a caterpillar that has made a pupa and another that has assumed the “j” position to make a pupa. Looks like we will have a bumper crop of these lovely creatures this fall. Below is a typical green Monarch pupa. The caterpillar apparently attached itself to the side of a recycled blue laundry basket we use for pulled weed and grass that was parked near a milkweed. A caterpillar or pupa found in the wild has 5% chance of survival. When rescued by humans, that survival rate jumps to 95%. However, pupas are not easy to remove as the substance they secrete to attach themselves to their host is a very strong adhesive. We found one Thursday pm the basket and Jane removed it by tying thread around the stem and then using a needle to gently lift off the circle of secretions around the stem. After releasing the pupa from the side of the laundry basket, Jane carefully tied it to the top of a plastic container. I put a caterpillar in that I had also found that morning and we gave it to one of our members along with plenty of milkweed leaves. The caterpillar was large so it was likely a pupa beside the other one at the top of the container by Friday morning. Just yesterday evening I went to get milkweed leaves for another caterpillar that Margie had found when leaving my home on Monday after a Loving Garland Green meeting. Lo and behold, there another fat caterpillar shown above, chomping on the milkweed. By Friday morning the caterpillar Margie found had morphed into a pupa. Now tonight as you can see in the photo to the right, the fat boy is now in a j-shape at the top of the container. By morning this one too will be a pupa. In about ten days it will eclose as a Monarch butterfly. Making music in Garland Texas is alive and well. Not only is this a great week for Monarchs and gardens, it’s a great week for people who make local music and people who like to listen to local music in Garland. Thursday night Charlie and I went to the MillHouse in downtown Garland for some great pizza and to listen to “The Back Porch Series”—recorded live on Air Texas Select Radio—hosted by Shaun Outen and sponsored by the MillHouse. As I watched the performers on stage and listened to their music, I couldn’t help but draw parallels between this event and one that took place almost 93 years ago in 1925 when on November 28 the Grand Ole Opry was first broadcast out of Nashville. We had seven different performers and many of the songs they performed were songs they had written. They were all great. Let’ hope “The Back Porch Series” becomes, like the Grand Ole Opry, a regular event in downtown Garland. Downtown Garland is alive with music played by local musicians. Not only at the MillHouse, but at the Intrinsic Smokehouse and Brewery, also located on our downtown square. The Intrinsic features live music from local musicians along with its great brews and barbecue. But the opportunity to enjoy live music doesn’t begin and end with Intrinsic and the MillHouse. Weather permitting, many of our local musicians gather on the green in the center area of our square for informal jams on Friday and Saturday nights. These musical gatherings draw their own growing audiences of fans who return to listen to the night music on the square weekend after weekend. 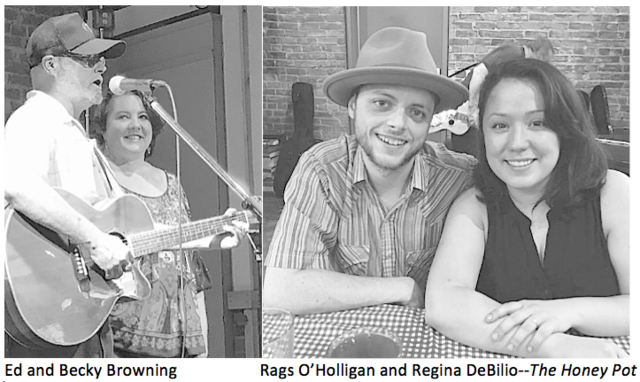 House concerts are once again gaining popularity. It’s a creative approach that performing artists and musicians are taking to reach new audiences and a great opportunity for artists to play to an intimate and appreciative audience. In 1920’s and 1930’s rent parties flourished in Detroit, New York and Chicago as a way to pay the rent. Many musicians today are looking for a way to make money doing what they love. There may be other house concerts in Garland, but the only concerts I’m aware of taking place in homes in Garland are those at “The Marigold House.” I’ve never been to a house concert before, (unless you count piano recitals when I was a kid) but on Saturday, September 22, I’m attending my first house concert at the Marigold House. Pianist Bobby Orozco will be performing many familiar tunes along with his original pieces.